My potatoes I planted for Christmas dinner are now showing, better late than never. At least it's still a ahrvest. Not quite Christmas though! Lol Marlene - that's good, better late than never as you say! We're hoping the greenhouse and polytunnel crops are going to give us a head start and lengthen the season Kev. I fear I shouldn't have planted Kale in the PT though as I think it is too warm in there for it. I don't think the kale will need the warmth but it might give you an earlier crop! 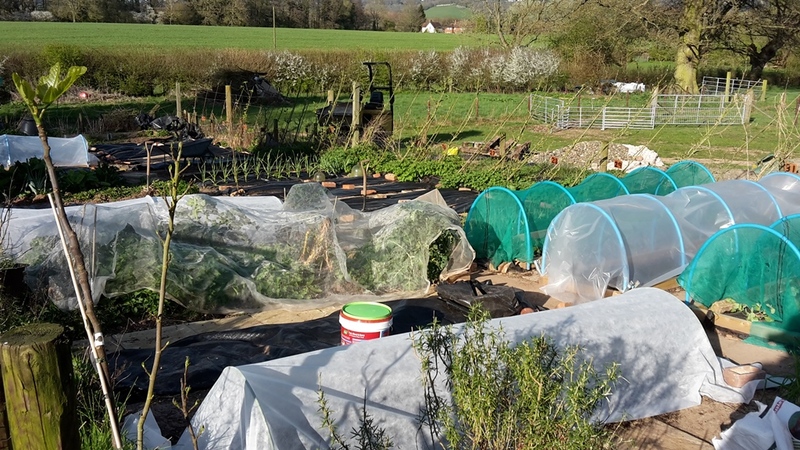 Polytunnel is high on my list to get one day! I just planted some seedlings yesterday, cold weather crops that I can transplant as soon as the snow melts. They can withstand cold and frost, so I hope that I can get a little jumpstart on the gardening and harvest some beets and spinach while I'm just starting to plant the summer garden! Your hoop houses are great! Transplanting is a great way to get a head start and lets you over lap crops as well. I'm doing loads of it this year. No snow on the ground here though! That looks really good, I have thought of doing something like that mainly to protect against insects as I am usually late putting things out so cold isn't an issue. This should help with insects, I might do all my carrots like it all summer and hope it keeps the fly away. I literally just plant early and cross my fingers and hope for the best. It usually works out. Not here, frosts wreck everything! I'm a big fan of planting in modules, to transplant as soon as conditions allow. Little gem lettuces, cylindrical beetroot (strangely not globes) & purple kohl rabi can all be raised from late Feb in an unheated, upright plastic covered cold frame. Planted out from March onward depending on the weather (SE UK), they can crop from April. Then through out the spring & summer, I keep a succession of module grown plants (which start to grow really quickly when planted out) to instantly fill spaces as other crops finish. Constant supply & variety are always the goals - at the moment I'm picking leeks, kale, spring cabbage, chard, rocket, lambs lettuce, rhubarb & purple sprouting broccoli. that's how I'm going now, transplant as much as I can. My kohl rabi should be ready next month due to this, hopefully some kale, and beets as well. I plan to keep transplanting a lot more this year. I also think it's much more economical with seed as well!